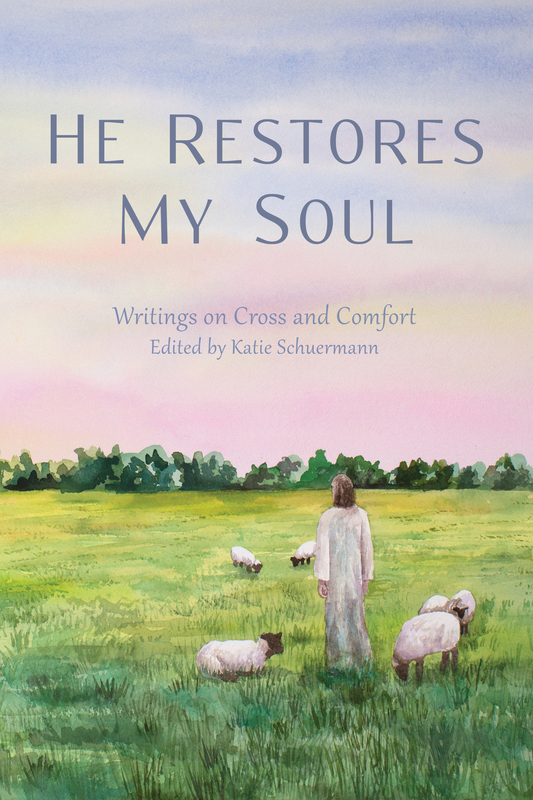 For the cover of He Restores My Soul, Katie Schuermann and Emmanuel Press commissioned an original work of art from Rebecca Shewmaker. While we gathered together ideas and expressed our vision to Rebecca, it was her artistic talent and theological understanding that produced a painting even more beautiful and peaceful than we imagined. Amidst the suffering and stress of this life, the Good Shepherd guards and keeps us, for “we are the people of His pasture, and the sheep of His hand” (Psalm 95:7). The sky is streaked with pink to indicate dawn, showing the hopefulness of a new day and reminding us that we will be with our Shepherd on that final new day. Rebecca based the landscape on her memories of pastures near her childhood home, pastures which always have wide open fields with treed fence lines. Jesus faces the sheep and is attentive to them; the sheep are aware of His presence and are generally oriented toward Him. They are relaxed, however, feeling free and confident to do what sheep do – sit, eat, and wander around. Some of them are closer to Him, some further away, but they (and we) are always well within His care. To create this tranquil scene, Rebecca used watercolor paint, applying thin layers that build color and tone from lightest to darkest. The first step in this landscape painting was the sky with its soft wash of pink, blue, and yellow. 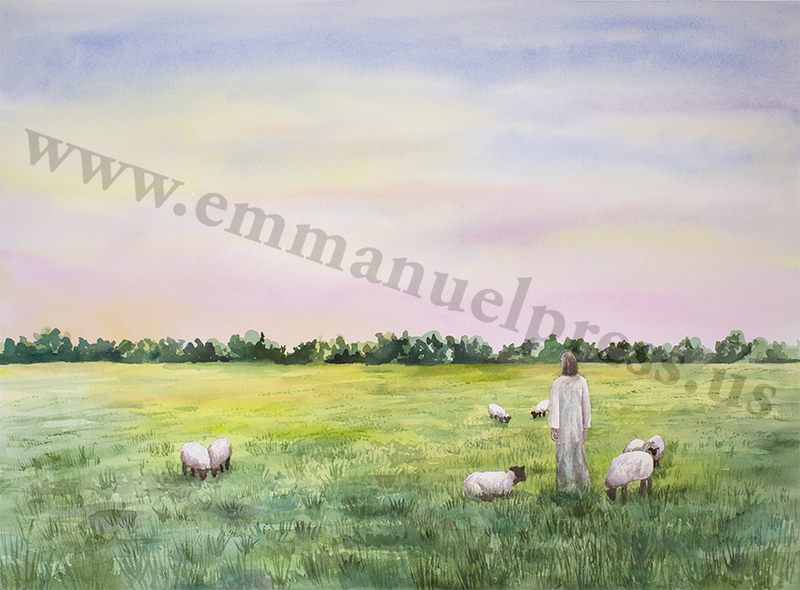 The field and trees were painted next in several layers, followed by the shadows and details on the sheep and shepherd. For more information about He Restores My Soul and a complete list of authors and topics, visit our pre-order page, where you can save 10% by ordering before the release date. We are also in the final days of our Christmas in July sale! Save 20% on Christmas cards available only at Emmanuel Press. Special thanks to our graphic designer Meghan Schultz, who collaborated with Janet Frese to design the cover. Visit Meghan’s Etsy site for a wide variety of theologically-based artwork, greeting cards, and decor. This entry was posted in Latest News and tagged He Restores My Soul, Katie Schuermann. Bookmark the permalink.